Just Adding Coconut Oil To Your Diet Won't Help You Lose Fat! Home » Just Adding Coconut Oil To Your Diet Won’t Help You Lose Fat! 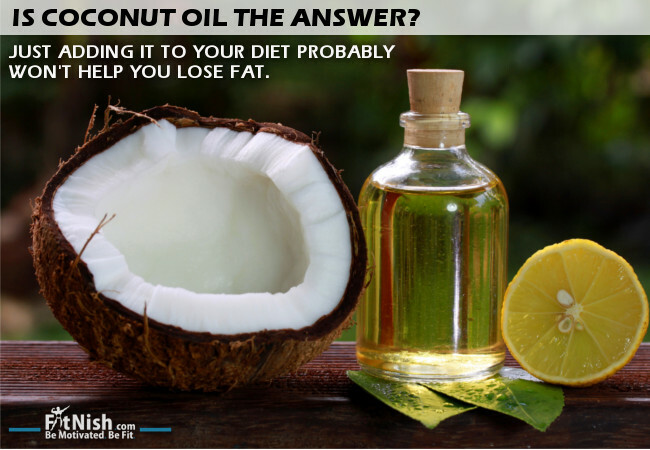 Just Adding Coconut Oil To Your Diet Won’t Help You Lose Fat! From the title I’m sure you were expecting to find an article full of research studies or something to show that coconut oil will not help you in losing weight and does not speed up fat loss. Fortunately, that is not really the case here. You see, as people in this technological media age, we are bombarded with so much information and marketed or targeted information which in some cases may not be true, or may not be entirely true. People twist information to keep some truth in it, in an attempt to adapt the information to market and sell their product or to sell the information itself in terms of page views etc. So what has this got to do with coconut oil? Well, one of the things people are always on the lookout for is something new and easy to use to speed up the process whatever it may be, especially when it comes to fitness and losing fat. They will read one article which says things like, you need to add coconut oil (for the record we are just using coconut oil as one specific example) to your diet in order to “rev up your metabolism” and “use fat for energy” and in turn lose fat around your waistline etc. While something like coconut oil may possibly do such things, to an extent, this is what can happen. Someone who is not too clued up and wants to lose weight, reads such an article and then immediately thinks that just by ADDING coconut oil to their diet they will start to reap the benefits and lose weight. But logically think about what you are doing. You are adding calories to your diet when you add coconut oil to it. In order to lose fat you need to reduce your calories slightly (to below your baseline at least). So in essence by doing this you may just see yourself picking up weight. Even replacing your vegetable oil for coconut oil in cooking, while a good thing, still won’t guarantee weight loss. Why? Because both are oils and both still contain fat which make up calories. So the bottom line is to get educated on your diet and training first and foremost before you go and add certain products and “special” trendy things into it hoping for some magical results.